Thunderbolt Fantasy is an anime made out of glove puppets. A regular Kotaku reader told me that, and I was like, excuse me? 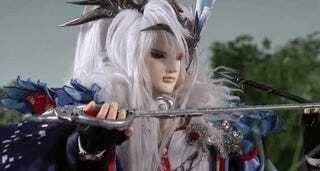 Released early July, Thunderbolt Fantasy is testing the public’s definition of “anime.” Puppeteers inhabiting anime-styled, classic Taiwanese hoteigeki dolls play out sword fights, love scenes and light banter on camera (with a little help from CGI). It’s a classic, Eastern-style fantasy, complete with sword and sorcery. But it’s also completely unique. I am now convinced that puppet shows can be anime, too. In the show, two siblings guard a legendary sword that evil forces are attempting to steal. The plot—and for that matter, writing—isn’t particularly special, but reminds me of Bunraku, a Japanese puppet style. Movement and emotion are primary; it’s all about visceral reactions. For an anime, it comes off trite. For puppet theater, it is absolutely spectacular. In its natural setting, Thunderbolt Fantasy’s artistic style benefits from not being a cartoon. Rain drops on leaves, smoky fires and realistically-glittering swords contrast well with the fantasy feel: an excellent juxtoposition of reality and imagination. On the other hand, the anime’s more fantastical elements—like a dragon flying off into the night—are harder to pull off with puppets. Crunchyroll is airing a new Thunderbolt Fantasy episode every Friday at noon. Gen Urobuchi, who also worked on Fate/Zero and Psycho-pass, is its original creator. Check it out and tell me if you think it’s an anime.